Federal is proud to introduce new Syntech Defense. These loads produce dynamic terminal performance with a hollow-point bullet that separates into three segments and a deep-penetrating core on impact. Anyone who finds a bird's nest can help scientists by reporting to the free NestWatch project at the Cornell Lab of Ornithology. NestWatch collects, analyzes, and distributes data, serving as a warehouse of nesting bird information. SIG SAUER, Inc. congratulates Team SIG professional shooters Daniel Horner and Lena Miculek for their National Championship titles at the 2019 USPSA SIG SAUER Multi-Gun Nationals in Frostproof, Florida. The 2019 USPSA SIG SAUER Multi-Gun Nationals had 180 individuals competing through twelve stages scored equally for speed and accuracy ranging from 5 to 425 yards. SIG SAUER, Inc. is honored to announce the conclusion of the Second Annual SIG Relentless Warrior Championship. The U.S. Military Academy at West Point Combat Weapons Team earned the top honor of being named the 2019 SIG Relentless Warrior Champions. Team Lapua member, Nancy Tompkins brought home regional titles at the Diamondback Metric Regional and Western Wildcat .22 rimfire smallbore matches this past month. Tompkins was competing with Lapua Center-X ammunition. Hoppe’s congratulates Jessie Harrison on her continued dominance at the 2019 U.S. Steel National Championship in Covington, Georgia. In a field of 460 of the Nation’s top shooters, Harrison won the Overall Single Stack division and the Ladies Open division, delivering her ninth Ladies Open National Title. Matthew Sanchez picked up his second medal this week at the National Junior Olympic Shooting Championships (NJOSC). This time he was atop the podium, winning gold in Men’s Air Rifle at the Olympic Shooting Center in Colorado Springs. With federal appropriations season fully underway, nearly a dozen boating and fishing organizations recently wrote to Senate appropriators and encouraged lawmakers to continue the long-time support for the protection and restoration of America’s Everglades by providing robust funding for the Comprehensive Everglades Restoration Plan (CERP). Registration is open for this summer’s “Becoming an Outdoors Woman” program, which is set for May 31 – June 2, in Marquette County. Featuring more than 200 free sessions and activities spanning five days, Pigeon Forge’s award-winning Wilderness Wildlife Week is set for May 7-11. Savage has added an adjustable gas block and longer barrel to stretch the out-of-the-box performance of its MSR 15 Recon platform even further. This popular long-range model was introduced to dealers in 2018, additional shipments continue to feed the marketplace. This state-led survey to supplement the Marine Recreational Information Program (MRIP) was developed and implemented to provide private boat catch estimates for important reef fish species in Florida that are more timely and precise for use in fisheries management. Available in two casting and six spinning models, the Mojo Yak delivers the high-powered backbone to hoist fish up from water level and the sensitivity to understand exactly where your lure lies underwater. Birchwood Casey introduces the Back Drop Precision Rimfire target, an addition to their expansive line of steel targets. It stresses accuracy by offering three shooting ports that will flip steel paddles to an upright position when the target is hit. MDT is proud to announce the addition of the 6mm BR AICS pattern magazine. Available in 12 round capacity, the new magazine is a one-step solution for feeding your 6mm BR variant rifle. To make the most of your hunts and improve your odds of scoring big when you hit the woods in search of trophy tuskers, Big&J® offers some tips on creating productive bait sites. ALPS OutdoorZ is committed to reversing the alarming decline of hunting participation numbers and to help expand new hunter recruitment efforts. To kick off the company's Save The Lifestyle initiative, ALPS OutdoorZ has introduced the Save The Lifestyle Mentor Pledge. GLOCK, Inc. was awarded a contract to supply U.S. Customs and Border Protection with the newest generation of GLOCK pistols. The contract calls for the replacement of existing .40 caliber duty handguns with 9X19 GLOCK pistols by 2021. Duty weapons will be replaced for CBP law enforcement personnel and additional Department of Homeland Security units which have chosen to purchase through the contract. The total economic impact of the firearms and ammunition industry in the United States increased from $19.1 billion in 2008 to $52.1 billion in 2018, a 171 percent increase, while the total number of full-time equivalent jobs rose from approximately 166,000 to almost 312,000, an 88 percent increase in that period, according to a report released by the National Shooting Sports Foundation. Blue Heron Communications, a full-service, outdoor-specialty marketing agency, announces the hiring of Valarie Shaw as Production & Traffic Manager. "It is with deep sadness that we mourn the passing of FLW Chairman and Chief Executive Officer, Irwin Jacobs and his loving wife, Alexandra. We as an organization are devastated by this loss and remember the leadership and passion with which Mr. Jacobs led our organization. We ask the bass fishing community to keep the Jacobs family in your thoughts and prayers during this time." A federal judge has issued a permanent injunction against the East St. Louis Housing Authority’s ban on firearms possession by residents of government subsidized public housing and thus granting a victory to the Second Amendment Foundation, which sued the town in 2018 over the ban. Gill is proud of their brand new product addition to their wet weather collection: the Fusion System. Fix It Sticks introduces a Cleaning Rod Kit for the Fix It Stick System that integrates a six-piece cleaning rod and bore obstruction removal tools into their modular system of handles, tools and torque limiters. If you enjoy the exhilarating action that comes with turkey hunting then the Floppin’ Gobbler Watchlist is for you. Wabash Valley College has a flagship team in its first year competing in the collegiate archery program with six archers, four of which are former participants in the Illinois S3DA program. The Springfield Armory XD(M) 10mm could be viewed as the ideal single all-around utility handgun — according to Contributing Editor Will Dabbs, MD. In the June issue of GUNS Magazine, Dabbs delivers a solid case for considering the mighty do-all 10mm. This week on The Revolution with Jim and Trav the boys are discussing Habitat for Hunters, wildlife land management. This week, Outdoors Radio features Mighway CEO Dave Simmons, Rattle-Free Trailer Hitch Stabilizer marketing guru Bob Kufahl, author Keith Crowley and pro angler Duffy Kopf. What can ballistic gel tests really determine about ammo? Plus, survival tools and training, ammunition for handgun and varmint hunting, the unique world of Cowboy Fast Draw, and more, this week on Tom Gresham's Gun Talk Radio. The Northern Arizona Shooting Range has announced all ranges will be open to the public beginning Saturday, April 13, although winter hours will remain in effect until May. Mammoth Coolers would like to extend their congratulations to Jin Young Ko on her win at the 2019 LPGA ANA Inspiration tournament. Mammoth Coolers was proud to donate their Ranger 125 coolers that were used at each tee box and on the practice course. Sturm, Ruger & Company, Inc. (NYSE: RGR) proudly announces its support of A Girl & A Gun Women's Shooting League. In its first year of sponsorship of AG & AG, Ruger joins as a Diamond+ Sponsor of the organization's two largest events in 2019 – the National Conference and Fall Festival Multi-Gun Challenge. RCBS is proud to have been named the Official Reloading Sponsor of Guardian Long Range Matches. Guardian Long Range Competitions are full-day precision shooting events held throughout the country. Wildlife and outdoors enthusiasts are reminded that nominations for the Arizona Outdoor Hall of Fame will be accepted through 5 p.m. April 30, 2019. The Ohio Department of Natural Resources (ODNR) Division of Wildlife announces that May 4-5 will be Ohio’s free fishing weekend, when Ohio residents may fish for free in any of Ohio’s public waters, including Lake Erie and the Ohio River. One of Mike’s favorite time of year. Turkey season. It’s off to Kansas to hunt with Romo at Shallow Creek Outfitters. After several different scenarios, Mike finds out how versatile Mojo’s Scoot and Shoot is on fired up Gobblers. Visit Panama City Beach is pleased to announce that its award-winning fishing and coastal lifestyle television series, “Chasin’ The Sun,” has been renewed for a fifth season on Discovery Channel: The show airs on Saturdays through June. According to SCI President Paul Babaz, "Rep. Grijalva's legislation will no more protect wildlife in Africa than pigs will fly. In fact, targeting hunting or hunters will have the opposite effect and will lead to more species loss and more poaching. Sadly, this bill specifically targets the importation of species that have seen the greatest benefit from well-regulated hunting programs." The Congressional Sportsmen's Foundation (CSF) has strongly supported this confirmation process from the beginning, emphasizing to Senate leadership that Bernhardt has demonstrated his dedication to the sportsmen's community. Land managers who want to learn about prescribed burning should make plans to attend a fire workshop in Holton on April 17, 2019. The workshop will begin at 5:30 p.m. and conclude at 7:30 p.m. at the Banner Creek Observatory and Science Center. Chattanooga, TN – Wednesday afternoon, under the curious scrutiny of onlookers gathered at the Coolidge Park boat ramp, Chattanooga students and scientists from the Tennessee Aquarium Conservation Institute carefully eased about 90 dinosaurs into the Tennessee River. At just 15-inches long, the nine-month-old Lake Sturgeon that slipped into the current still have many years of growing before potentially becoming an eight-foot river giant. Even at this early stage, however, these 89 sleek, armor-plated fish embodied a wealth of promise. Each of these young fish represents the latest chapter in a now-21-year effort by the Aquarium and its conservation partners to restore the Lake Sturgeon to its historic range. On Wednesday, the fish were released by representatives from the Aquarium, the Tennessee Wildlife Resources Agency as well as students from Chattanooga Girls Leadership Academy and participants in Girls Preparatory School’s Tucker River Fellows program. Now back in their ancestral waters, each Lake Sturgeon could live for more than a century. These fish represent the next generation of a species that first appeared alongside dinosaurs during the late Cretaceous Period but whose story almost ended abruptly not from a meteor strike, but our own poor decisions just a few decades ago. In the 1970s the Lake Sturgeon had all but disappeared from the Tennessee River due to overfishing, poor water quality and man-made alterations to the waterway. By the late 1990s, landmark legislation and responsible water management practices had improved conditions to the point that biologists thought it possible for the river to once again support a population of these ancient fish. In 1998, with the aim of restoring the Lake Sturgeon to the river, the Aquarium and several partner organizations created the Lake Sturgeon Working Group. Since the formation of that organization, more than 220,000 juvenile Lake Sturgeon raised from eggs collected in the Great Lakes have been reintroduced to the Tennessee and Cumberland river drainages. 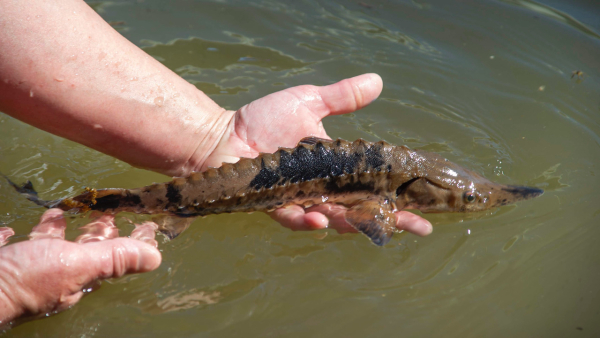 Although they’re barely the length of a bowling pin, the baby Lake Sturgeon that entered the river on Wednesday are veritable giants compared to the vast majority of the fish that preceded them, most of which are around six inches long when they are released. These Sturgeon are so much larger because they were held for longer at the Conservation Institute’s freshwater science center to help biologists better understand the potential effects of using coded wire tags to track their movement after release. Each tiny tag measures a couple of millimeters long and is inserted just below the surface of the fish’s rostrum (snout). When scientists collect tagged fish later during monitoring efforts, they can scan these tags to chart how the fish are moving throughout their range. However, a Sturgeon’s rostrum also houses a kind of antenna that can detect the unique electric signatures created by the movement of the bottom-dwelling animals upon which it feeds. To ensure the tags weren’t adversely affecting the Sturgeons’ ability to feed, Conservation Institute scientists held back two groups of fish — half were tagged while the others were left untagged. Each group was weighed and then fed a controlled amount of food for 40 days before being measured again. At the end of the study period, says Aquarium Reintroduction Biologist Meredith Harris, there was no difference in size between the tagged and untagged fish. These results indicate that the tags either aren’t affecting the Sturgeons’ electro-sensing capabilities, or if they are, that the fish are compensating for the interference by relying on their other senses to find prey. Now that they’ve finally joined the rest of the reintroduced Sturgeon in the river, these 89 fish served an important role in the protection of their species. These releases offer an opportunity for members of the public to form a meaningful bond with an imperiled native species and further raise awareness of the ongoing effort to restore this ancient fish Harris says. For more information about Lake Sturgeon and the Aquarium’s work with this species, visit tnaqua.org/protecting-animals/lake-sturgeon.